What do The Big Wedding, Everybody’s Fine, Revolutionary Road, The Town, All Good Things, Hope Springs, Righteous Kill, and We Need to Talk About Kevin all have in common? They’re among many of the movies filmed in Connecticut in recent years. The movie is about a self-involved real estate agent (Michael Douglas), who finds himself in charge of caring for the granddaughter he never knew existed, portrayed by the adorable Sterling Jerins. Diane Keaton plays the quirky, fun-loving neighbor who helps Douglas’s character handle his new dilemma. By the way, if you think Sterling looks familiar, it’s because she also starred in this summer’s two blockbuster hits, the hugely popular horror flick The Conjuring and Brad Pitt’s famous zombie film World War Z. In addition to Diane Keaton, Michael Douglas, and Sterling Jerins, And So It Goes features actors Frankie Valli, Frances Ternhagen, Scott Shepherd and Sterling Jenis. 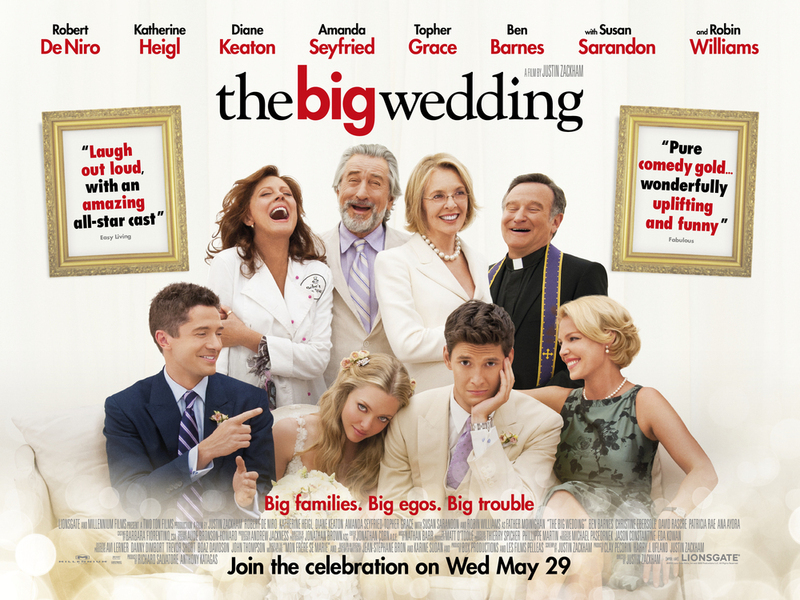 Poster of The Big Wedding, another movie filmed in Connecticut, also starring Diane Keaton - via Google. For weeks this summer, the production has been in Connecticut filming various scenes of the movie. Other film locations include California and Manchester, England. Connecticut film locations used include the Gabriele’s Italian Steak House in Greenwich, the Lake Compounce amusement park in Bristol, and various locations in Fairfield, Bridgeport, Greenwich and Stamford. Lake Compounce and its staff was thrilled to have a major Hollywood movie filming in their backyard. “When we were approached by Castle Rock Entertainment, we were excited to be a part of the film making process, and are looking forward to bringing a little bit of Hollywood to Bristol,” said Sara Frias, marketing director for Lake Compounce. — Sara Frias, marketing director for Lake Compounce Amusement Park. 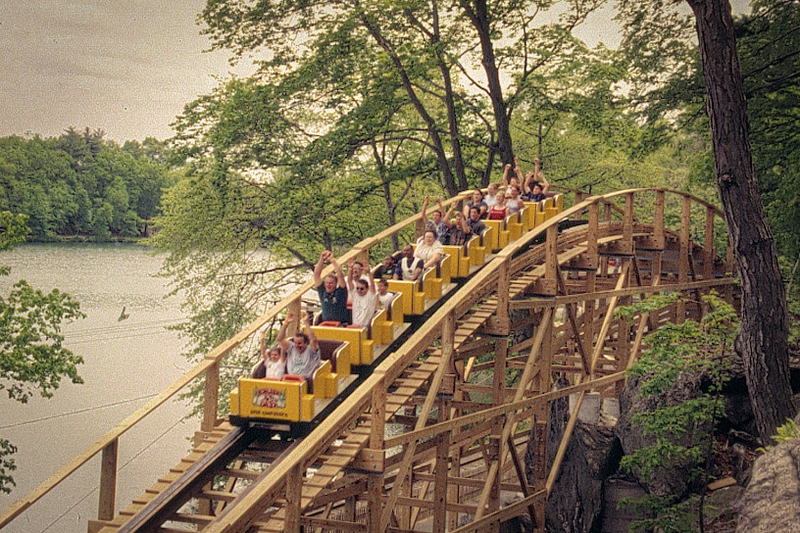 PHOTO CREDIT: An old-fashioned wooden roller coaster ride at Lake Compounce, one of the film locations of And So It Goes. Photo is from Reel-Scout’s online film location library. To not disrupt the normal daily business of the theme park, Lake Compounce stayed open during the filming so park guests may even find themselves show up as “extras” in the movie. Frias said he and the park employees enjoyed working with the film crew and cast and were happy to be a part of it. More filming took place in Bridgeport, Connecticut, on Ferris Street, and at the marina and boardwalk at Captain’s Cove. The scenic waterfront area is definitely one of the main reasons And So It Goes set up camp to shoot in Bridgeport. PHOTO CREDIT: Above photo of Captain’s Cove Seaport, is from here. “We combed the entire coastline, from Rhode Island to Port Chester, looking for a multi-family on the water” before finding the perfect Bridgeport house to film in, said Frank Trotta, Jr., location scout for the Castle Rock Entertainment film. For the movie, the production cleaned up the waterfront, planted flowers, and renovated a Ferris Street duplex. PHOTO CREDIT: The crew of And So It Goes renovated a duplex in Bridgeport preparing it for filming. Photo is from here. They also replaced (for free) the drooping fence surrounding Bloodroot, a vegan and vegetarian restaurant located across the street from the house used as one of the film locations. “It’s a lot of activity for us,” said Noel Furie, one of Bloodroot’s owners. “You know, it’s kind of exciting.” Neighbors in the area were impressed with the film crews’ attentiveness and efforts to clean up the waterfront area. Many crew members, including Trotta, became Bloodroot’s regular lunch customers. 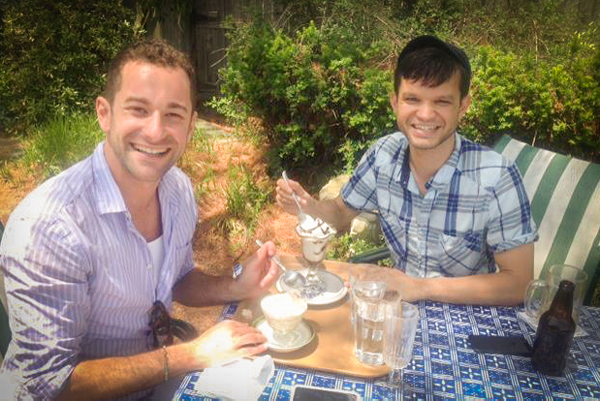 PHOTO CREDIT: Ethan Tobman and Will, from the production design team of And So It Goes, enjoyed desserts on the terrace at Bloodroot. Photo is from the official Bloodroot’s Facebook page. “They have been considerate,” said Donna Andrade, a homeowner on the corner of Ferris Street and Harbor Avenue. She noted that the crew members were always careful not to block anyone’s driveway. Bridgeport is used to all this attention from Hollywood. A few years ago, it was the star in two featured films, Righteous Kill and All Good Things. For more information on filming in Connecticut, visit the Connecticut Film Office, a Reel-Scout client. PHOTO CREDIT: Top photo features Diane Keaton, Michael Douglas and little Sterling Jerins, filming And So It Goes at Lake Compounce. Photo is from The Hartford Courant.